Co-Conspirator’s event design by SabaWear questions who is the warrior and how else can we challenge social norms. In recent research, Native Americans endure alcoholism-related mortality rates that are 514% higher than the general population. 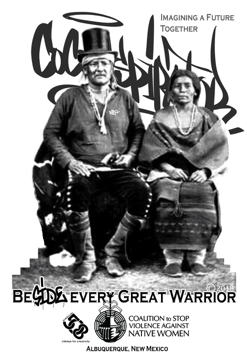 Suicide is the 2nd leading cause of death for Native Americans and is nearly three times higher than the national rate (Indian Health Service, 2012). Additionally, Native boys face untimely deaths that are violence-related 75% of the time, which include both homicide and suicide (Indian Health Service, 2010). While these statistics do not lessen the appalling conditions of Indigenous women and children, they do infer the ignored crisis that affect Indigenous men – which is inexorably tied to violence against our land, women, families and communities. 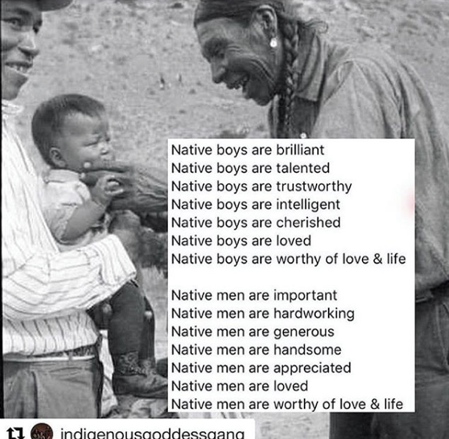 Truthfully, we need our Indigenous boys and men in our movements because no one is disposable. We also need our boys and men to take up the work of dismantling misogyny, male privilege and patriarchy within our own communities because the emotional and intellectual labor should not only be on the backs of our Indigenous womyn, youth, and our genderqueer and non-binary relatives. Patriarchy, much like racism, is a system of oppression that effects all people that are not in alignment with those in power, even male bodies. Patriarchy was unknown to our communities prior to colonialism. In many ways the work of ending the violence that is experienced by our communities is tied directly to dismantling these introduced systems of oppression that are not a traditional part of the nations that we represent and the cultures that we participate in. 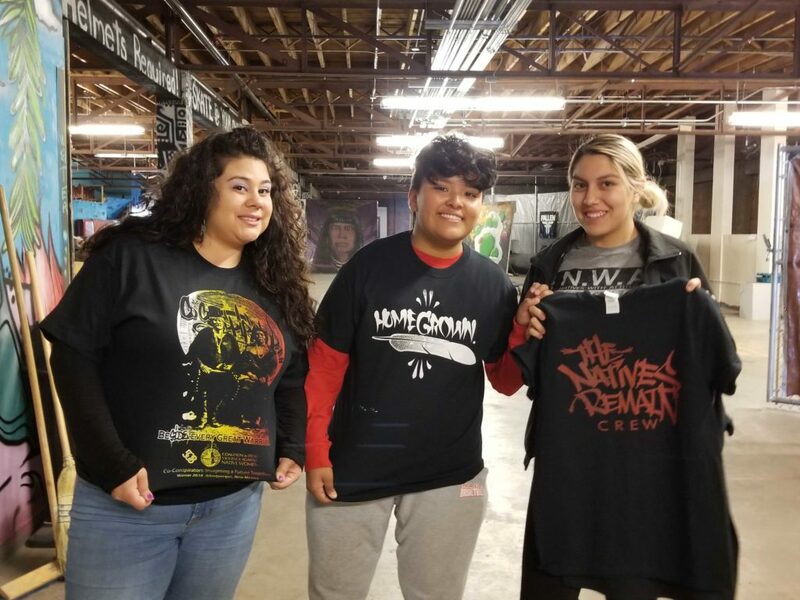 Mercedez Holtry, resident Warehouse 508 Poeta and Coordinator, wearing our Co-Conspirators event design standing with two of Warehouse 508’s Poetry Interns wearing the designs that they chose to print at the workshop with SabaWear. Reyes Devore shared some of the vision from the Pueblo Action Alliance and how we need all people to participate in the movement to save Indigenous lands from outside interests. The “Co-Conspirators: Imagining a Future Together,” was held in December 2018 and was a space that CSVANW wanted to hold for our Indigenous boys and men to come together, build community, celebrate and find encouragement to use their voices to uplift our womyn and children. There are steps that must be taken in order to strengthen the voices of boys and men of color. We must gather community support to educate and create positive messaging and resources in both urban spaces and tribal communities; ultimately building a foundation that effectively changes culture by addressing negative attitudes, beliefs, and behaviors about ourselves into positive ones. Albert Rosales was a great mentor on this community project! Participants were given passports to ensure they didn’t miss out on any activities. 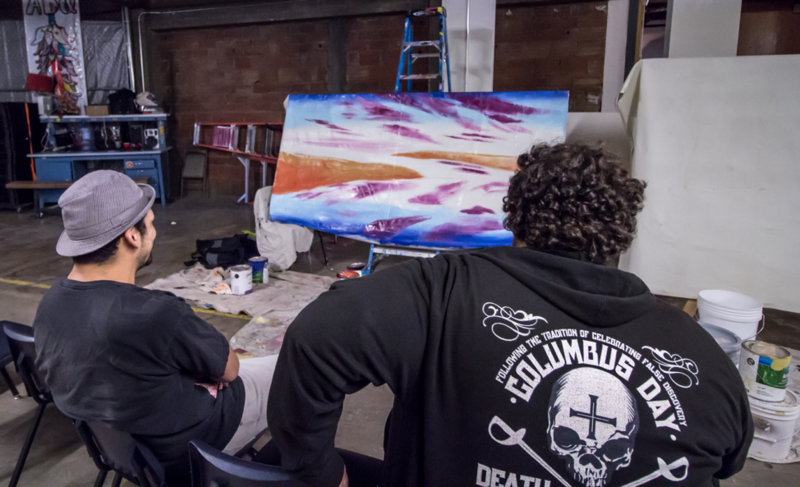 Albert Rosales and Roberto Reyes, Warehouse 508’s Venue Manager sitting and envisioning the community art piece while it was in its early stages. In an effort to build community, we encouraged our attendees to print their own gear in collaboration with SabaWear. This was a highly popular activity that most attendees participated in. 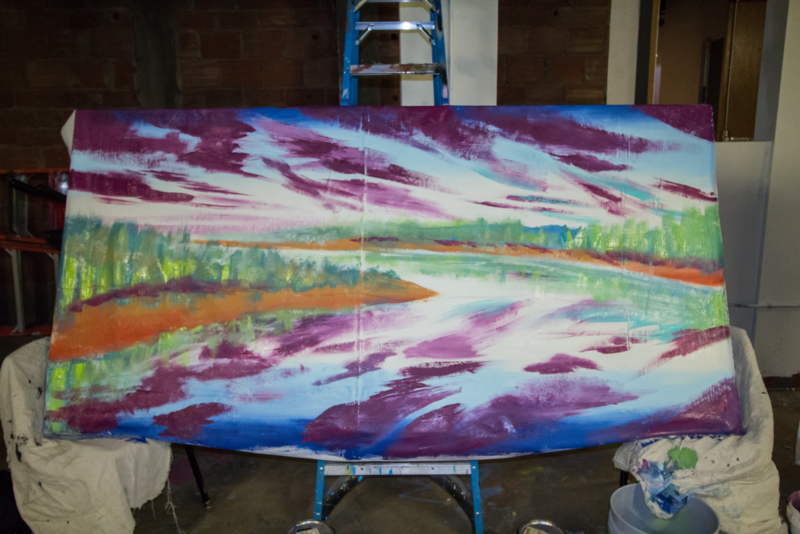 We also created a mural art piece with Albert Rosales to show a direct link to land and alternative was of sharing our stories. 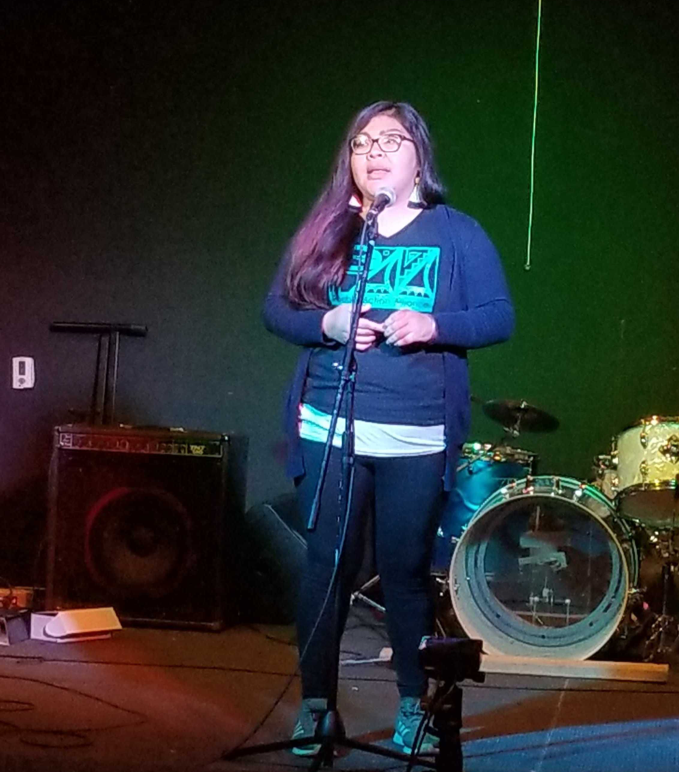 During the course of the event there was an open mic space for our relatives to share their music, poems, comments, and spoken word pieces, hosted by Freddy Lopez, Warehouse 508’s Minister of Culture and Keioshiah Peter, CSVANW’s Native Youth Coordinator. 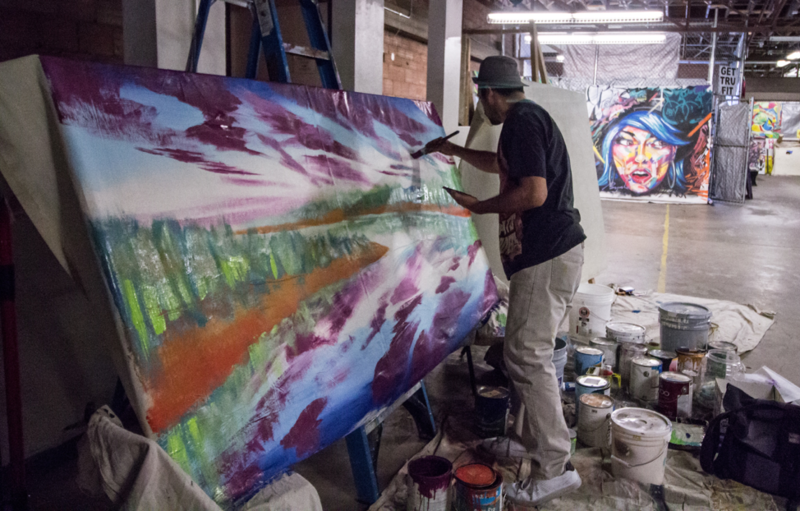 Art and expression were a major piece of the Co-Conspirators event and allowed our participants to utilize creativity as a catalyst to convey their understanding of their role in their own territory. 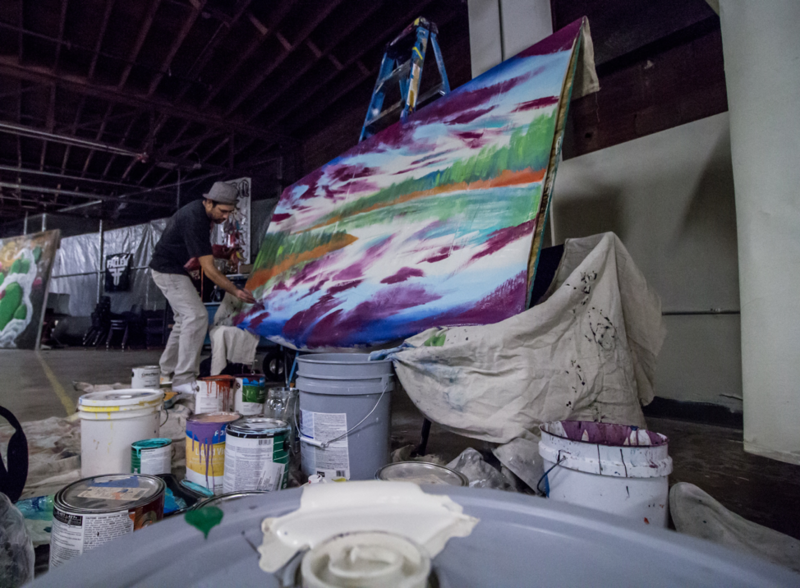 We acknowledge that the screen printing, open mic, panel discussion, and mural painting activities allowed us to focus on sustaining conversations through community gathering and the networking of skills. The community made some great additions to this piece under Albert’s mentorship and guidance. We ended the evening with a panel to focus on the ways that our boys and men are working to dismantle patriarchy in their own homes and communities. The panel was hosted by Cecelia Westman, CSVANW’s Advocate Coordinator who has previous experience engaging men and boys in dialogues and activities centered on ending patriarchal oppression. The panel participants were Hakim Bellamy, Randy Sabaquie, Nate Herndon, and Roberto Reyes. Panel participants reflected on their own experiences with toxic masculinity and how they have both participated in it and challenged it within their own families, amongst their peers, and in their communities. We appreciate how transparent the panel discussion was and the points of vulnerability that were shared with our attendees as life lessons. Together, we call on our Indigenous boys and men to eliminate violence against our Native women and children. We would like to thank all of the different organizations that participated in making this event a success by providing resources and community interaction including (but not limited to): Warehouse 508, Together For Brothers, NACA Hiyapo Group, Red Planet Books, the Transgender Resource Center of New Mexico, SabaWear, First Nations HealthSource, Planned Parenthood, Pueblo Action Alliance, the New Mexico Crime Victims Reperation Commission, and Cycles of Life.